The Netherlands is crisscrossed by almost 7000km of train tracks, and bar the odd delay, train travel here works like clockwork. Commuting between cities for work is a breeze, and 438 million riders step onto the distinctive blue and yellow trains every year. But train travel here isn’t cheap. 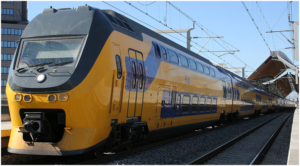 The 25 minute trip between Amsterdam Centraal and Utrecht Centraalcosts €7.50. Commuting on this route for work every day will set you back €75 a week. Of course, there’s always ways to cut costs. We’ve outlined a few of them here, and had a chat with some enterprising Dutch high school students who can offer you tickets at a massive discount. For those who travel regularly, NS offer a range of season tickets, costing between €4.17 per month for a 40% discount on weekends and off-peak hours, to €333 for unlimited travel on all routes at all times.Check here for more details. Friends who travel together save together. If your Dutch mate has a discount travel card, i.e. If they’re a student or an old age pensioner, you can apply a discount to your own card when you travel together. It’s called the “samenreiskorting” or “combined travel discount” and can be applied to your OV Chipkaart at the top-up machines in any station. Travelling by yourself with this discount applied is forbidden, but if you’re stuck, it’s easy to find a Dutch student who’ll let you sit beside them when the inspector comes around. Check the NS website for more details. Group return tickets are the holy grail of cheap train tickets. You can travel between any two stations in the whole country for as little as 7 euros when you book as part of a group. The more people in the group, the cheaper the tickets. Of course, finding ten people who want to travel the same route as you on the same day can be difficult. Until now, travelers would sign up to facebook groups and arrange to buy the tickets together. This meant transferring money to a stranger, hoping enough people fill the group, and waiting for the email with your ticket. It was cheap, but inefficient. 16 year old Dutch high school student Rong Dong set out to fix this. His website and facebook group offerdiscount tickets along several routes that cover most destinations in the Netherlands. It’s not necessary to travel from the beginning of a route to the end. Any stations in between are covered by the ticket. “We sell 100% guaranteed tickets. There’s no ‘sorry, we’re full’ [problems with the old facebook groups], and you can buy them at any time until we close for the day,” he told us. Regardless of how many people are travelling your route, Rong guarantees you a ticket for the price you paid. If the group number is not met, Rong absorbs the cost. “Our main focus is to help people,” he told ExpatRepublic. To put the savings in perspective, travelling from Amsterdam to Groningen and back would normally cost €51. With a group return ticket it only costs between €7 and €10. “We focus mostly on internationals, like students, tourists, and foreigners here on a temporary basis, as they are the ones that use our system the most,” he said. As such, Rong’s site and facebook page are both run in English. Rong and his team balance running their ticket business with their schoolwork. Their teachers are aware of the business, but have not awarded the students with extra marks for entrepreneurship. “That would be nice” he said. 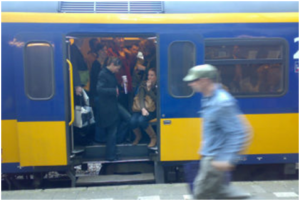 The Dutch train operator NS initially introduced the tickets to encourage families and large groups like football teams to use the train instead of driving. The company has told the press that it’s aware of bargain-hunters exploiting the system and intends to introduce “structural changes” to clamp down on individuals abusing the group tickets. Until then, Rong’s site is open for business and can slash serious cash off your travel expenses. Check it out next time you need to take a train.